Do you know if Wayne Watne, the missionary/forrester who made friends with Josh works with this group of people? I am sort of stuck on the Set Free Christian Fellowship. Does Wayne Watne the missionary work with these people? How can we find out more about the Fellowship? what? NO leads? now I just do not believe that? am I the only one who thinks they have at least "something" and are not saying? how can they have NO leads at all? Mike Tallman is the pastor for the Set Free place and I found a connection with Mike and McCleary. If you watch that video I posted the Sheriff said they have no leads but leads were still coming in....I don't know but it's looking kinda hopeless right now. We need to find out exactly where Mullin or Mullins creek is....we need pictures taken of the creek cause we don't see it on a map. We(or I) need to find out exactly where that dollar store in Elma is located and if it's near the Set Free church/place. We need to find out if Melissa was dating/seeing/talking to anyone related to the Set Free church/place. I'm giving myself a headache and praying for little Lindsey. Pastor Michael Tallman has been part of Set Free Christian Fellowship of Elma since 2001. He served under Pastor Kenny Rice the Founder of our Ministry, for many years as well as Pastor Jerry Wilson from The Cross in Burien, and Pastor Dave Wade from Fountain Of The Valley in Auburn. Pastor Michael has previously partnered with Dr. Marty Schafer, Pastor Dave Yarbrough and currently Pastor Randy Brown from First Baptist Montesano. Set Free Ministry is partnered with First Baptist Church in Montesano, Pastored by Randy Brown. The family of First Baptist Church Montesano has truly embraced the family of Set Free. Randy Pastored Vieux Carre Baptist Church in New Orleans French Quarter for five years, then two years in the mission fields of South Asia, before coming to Montesano. I marked mullin creek on the map, I asked a local. 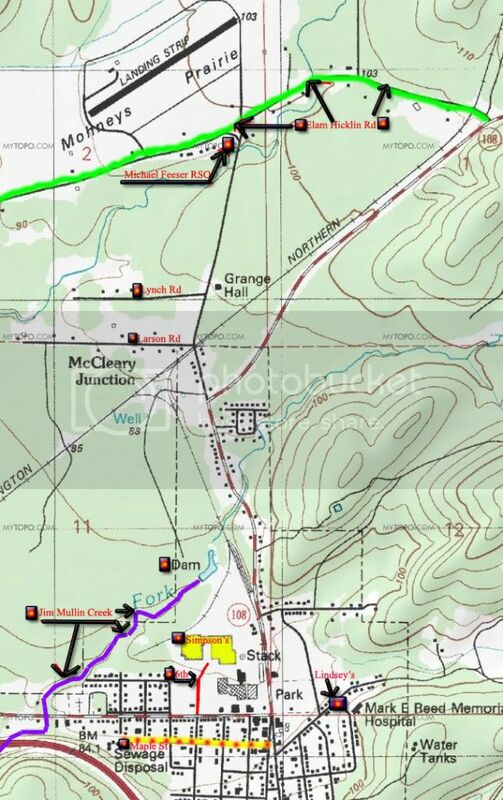 it is the creek up behind the simpson door/mill its on the last topo map I posted. I marked it in purple on the map. should be within the last 5 pages on here. it is the creek lindsey and the kids all swim in. and I am also told some kids call it Tweaker's creek. so guess a bunch of druggies must hang out there. Thanks DD.I will try to get a satillite map of the creek or maybe find a picture online.What is the correct name of the creek? Thank you DD!Somehow I missed this.I doubt Lindsey would have walked all that way to that creek by herself at that time of night.....unless she was meeting someone there. Also I have been looking at the Evergreen Christian Center website who has the McCleary Campus that Wayne Wahtne is missionary for - they do have Jail Ministry Program. MCCLEARY, Wash. -- The search for missing 11-year-old Lindsey Baum got nationwide attention when her parents appeared on CBS' 'The Early Show' Monday morning. Lindsey disappeared on June 26 while walking home in McCleary and although thousands of fliers have been passed out and both the FBI and law enforcement in McCleary have been searching for her, there has been no sign of Lindsey. Her 11th birthday was July 7. Authorities have been working on the theory that she might have run away to Tennessee, where her father lives, but Rick Scott of the Gray’s Harbor County Sheriff’s Office said it’s unlikely that someone her age would be gone this long without “surfacing in some manner.” Lindsey’s father, Scott Baum, a member of the Tennessee National Guard who is deploying to Iraq soon, told authorities that he has not seen or heard from his daughter since her disappearance. Officials have not had any new developments in the case but ask anyone with information to contact the Grays Harbor County Sheriff’s office at 866-915-8299 or send an e-mail to: soadmin@co.grays-harbor.wa.us.